Well, the germs-vs-humans battle has been going on in our household this week. You know, the fight with the cold/allergy/sinus warriors…yeah, all winter long we think of the sunny and warmer weather of spring while conveniently forgetting these guys. But during a brief interlude after Mr. Kimett had won his battle and before I fully embark on mine, (it seems no amount of vitamin C and hand sanitizer has been able to keep it at bay), I was able to change my nail design yesterday. It’s (almost past) time to celebrate April Birthdays! 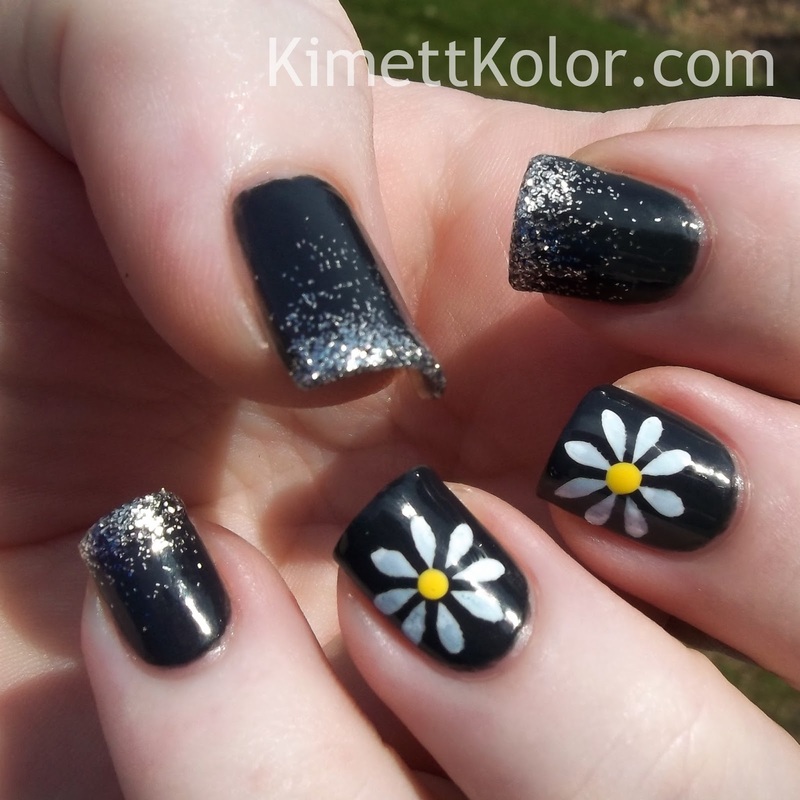 In case you didn’t catch the background info on these posts, check out the other Kimett Kolor Theme of the Month posts: here, here and here. Each month, I like to honor those whose birthdays are celebrated by painting my nails with a combination of the birth month’s gemstones and flowers. 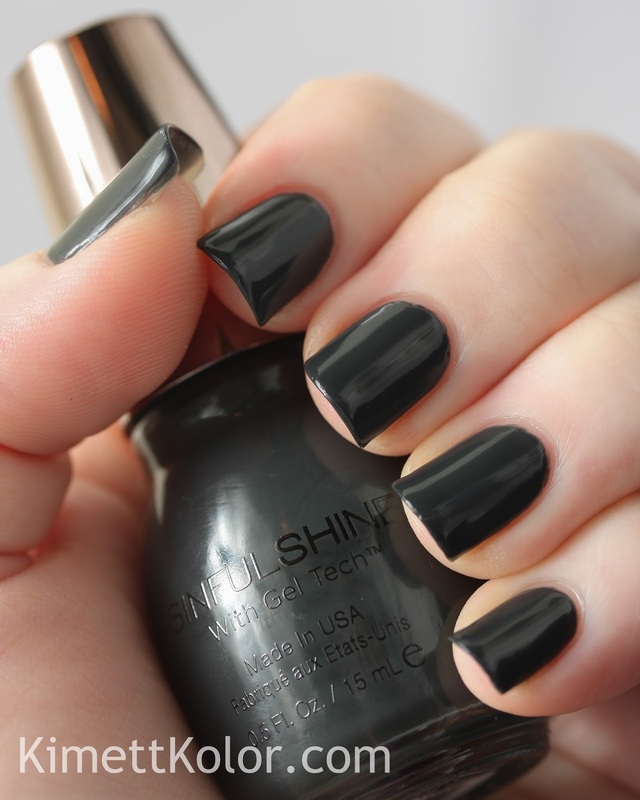 This design started with a lovely steel gray polish, SinfulSHINE Steel Reserve. 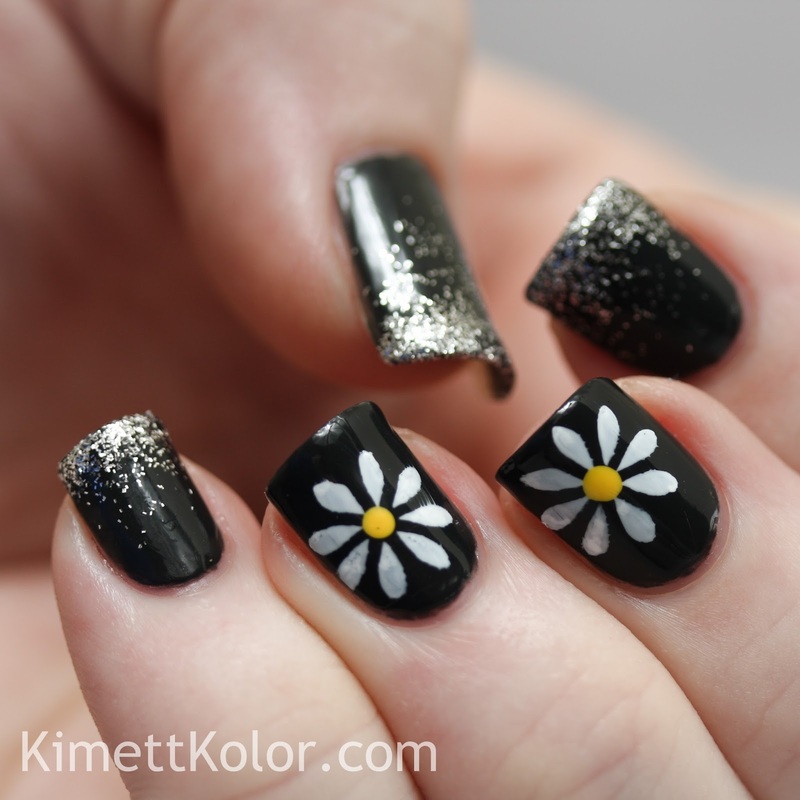 I used one thin coat and second thicker coat for the base of this design. 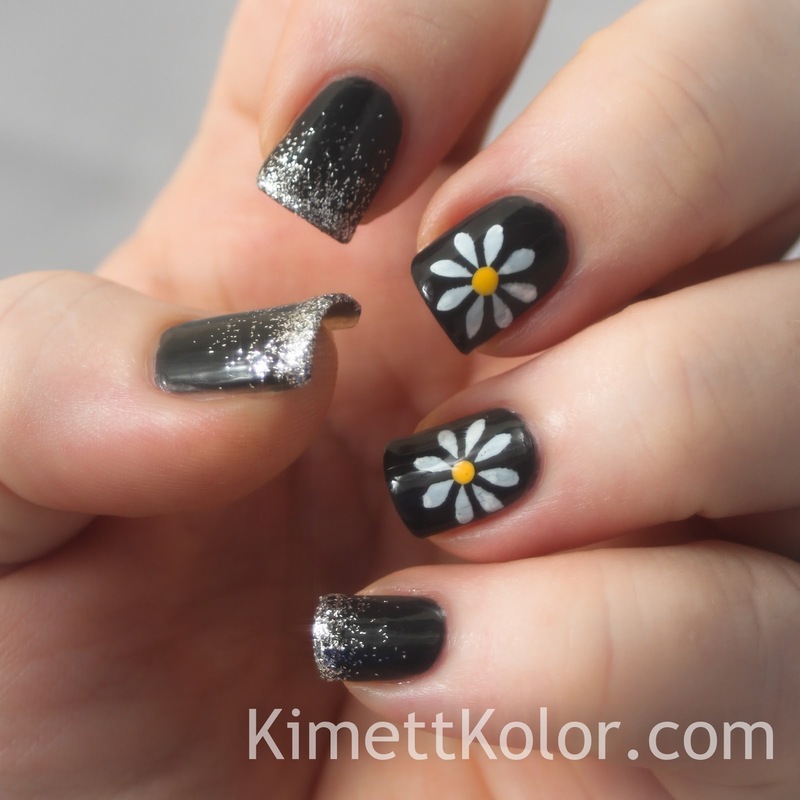 I chose this color for two reasons: 1) I wanted a nice contrast with the white daisies and 2) since I didn’t have diamonds to put on my nails, this color was a good base for the glitter topper I used shine as close to real diamonds as possible. (I know the glitter is silver – but if you keep an open mind….). I liked the idea of a glitter-gradient, rather than a full nail of the opaque glitter. It seemed more appropriate to have diamond-covered tips. a-England‘s glitter Merlin is very pretty and seemed a good one to chose to make diamond-like sparkle. In the photo above and below, I used a cross-screen filter on my lens trying to get that sparkly effect of light on the glitter. 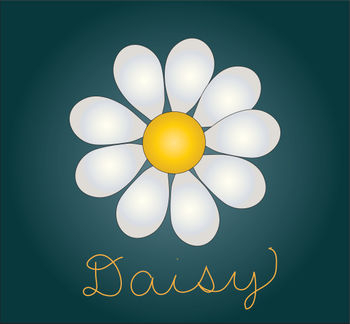 This dulled the look of the daisies, but it was fun to experiment. 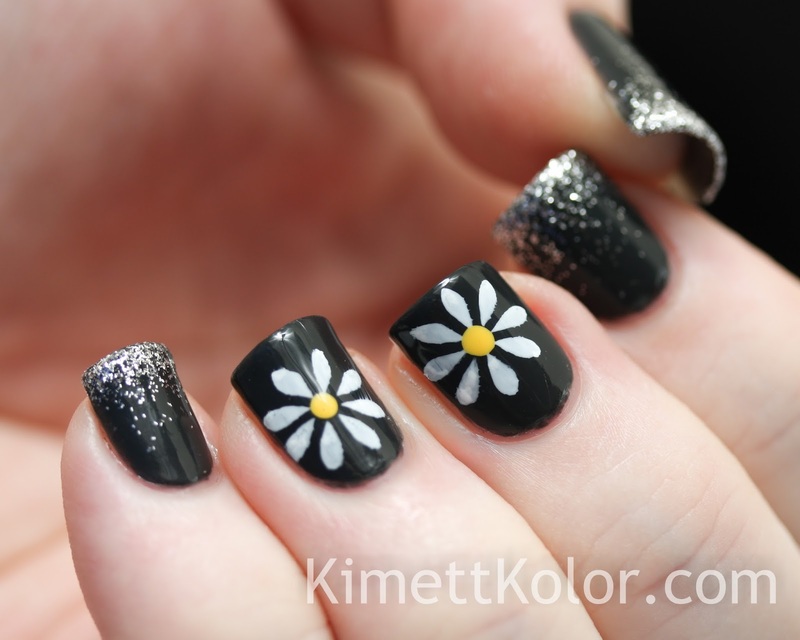 What do you think of mixing the formality of diamonds with the casual look of daisies? I don’t think I would have tried this combination if it hadn’t been for my Theme of the Month. I still have them on my fingers and I’m enjoying the little bit of bling and fun together. 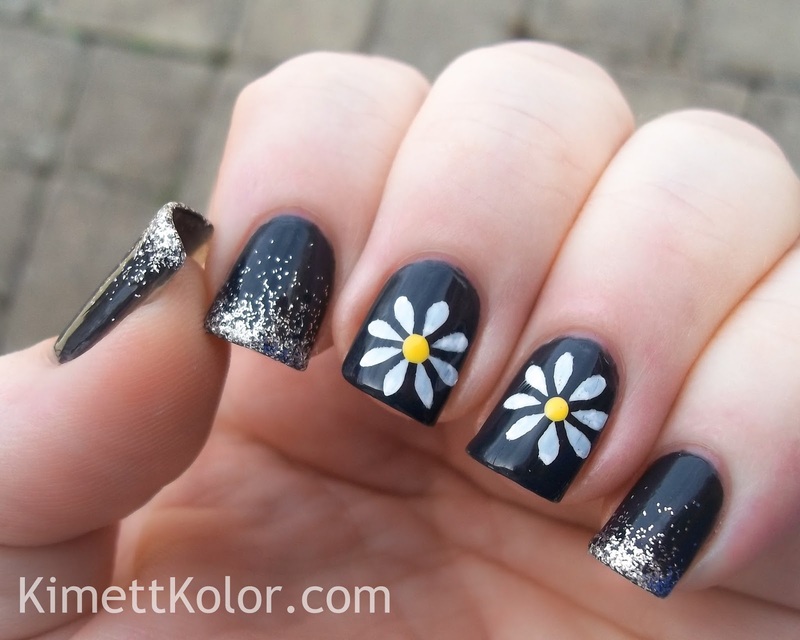 It’s more noticeable in the photos that I didn’t get the daisies centered so well on my nails. 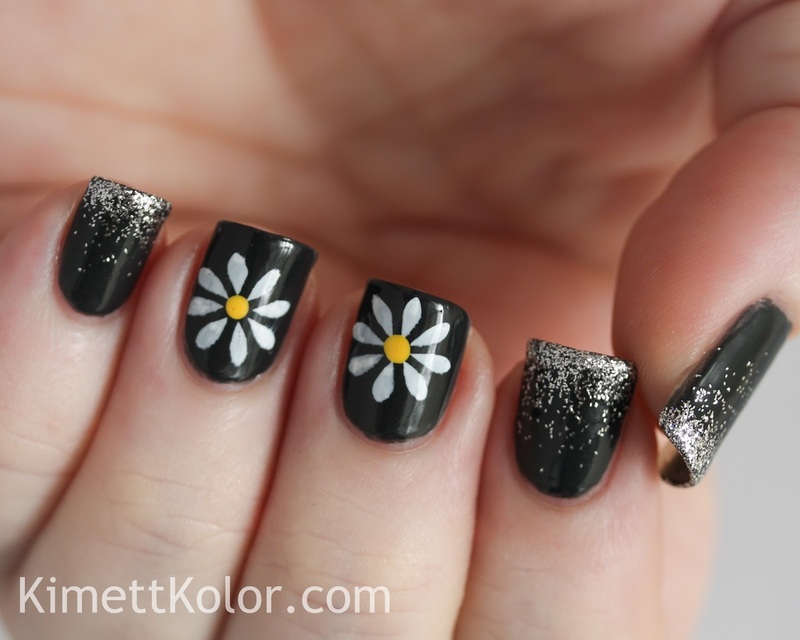 My excuse: I used a white stamper and white polish – I couldn’t see where I was placing the design. So, I guess not so bad for flying blind. I could blame it on sneezing; but that didn’t really kick in till today. And this last photo, taken in the direct sunlight shows the shiny tips off nicely too. This was the first time I tried a glitter gradient. I used the method shown in Emily’s tutorial, in her post: The Laquerologist: Teal and Bronze Glitter Gradient [and Tutorial]. 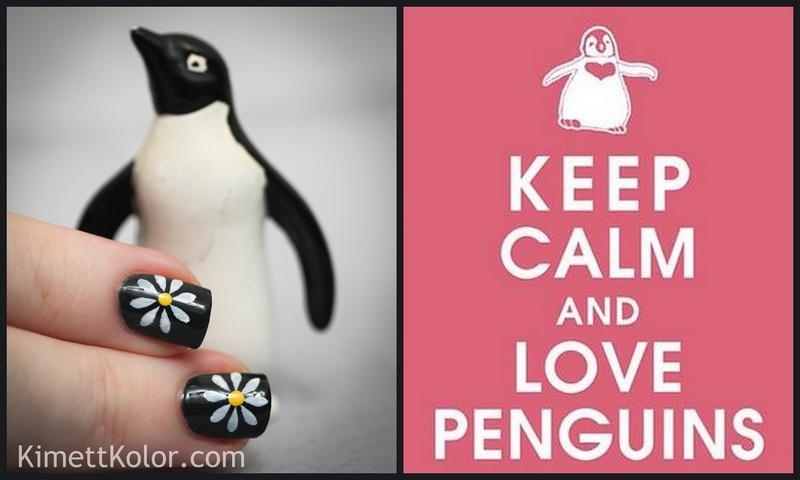 April 25, 2014 – WORLD PENGUIN DAY! You might have seen these photos yesterday on my Google+ and Facebook to celebrate World Penguin Day. I missed celebrating Penguin Awareness Day (it was in January). Did you know there’s two penguin holidays each year? Me neither. But, I recently clicked my way to Cute-calendar.com and was tickled to see that these animals rate two special days a year! 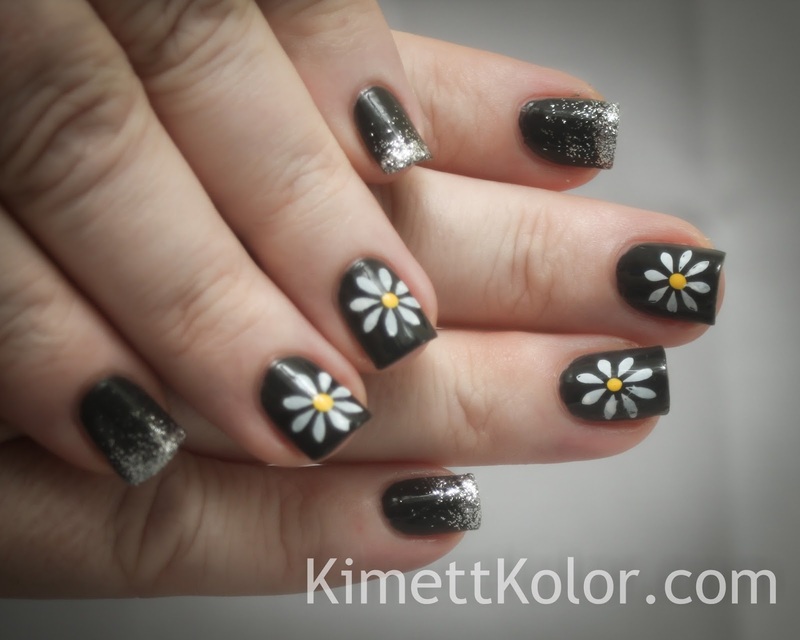 Oh – and I hope you’ve voted for your choice for Kimett Kolor’s 50th post (this one is #48). If you haven’t, please do! (top right corner of website). THANKS!! 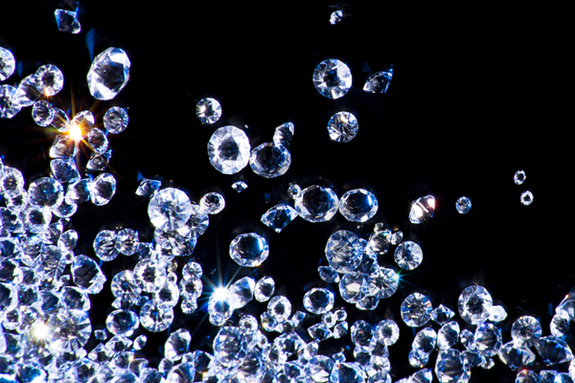 Photo Source: Live Science: How Are Diamonds Made? So a Happy April Birthday to everyone reading this!!! If you were born in April, I hope your day was or will be special. I’d love to hear about it in the comments. Thanks for visiting!! And, I hope those cold/allergy/sinus warriors skip your home!